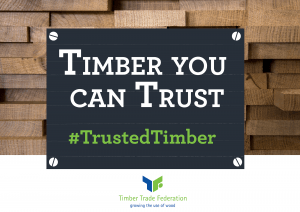 A Trader is any natural or legal person who buys and sells timber or timber products already placed on the EU market. For list of countries in the European Union (EU) and the European Economic Area (EEA), check here. Traders are required to have basic traceability information on supplier and seller and keep these records for at least 5 years. Gather information about the product (name and type), supplier (name and address), quantity, and the traders to whom the timber products were supplied to. TTF members are also required to gather information about the Species, Country of Production and Country of Forest of the products. Under the current EU Timber Regulation, due diligence (incl. risk assessment and mitigation) is not a mandatory requirement for Traders (importing from the EU or the EEA into the UK). 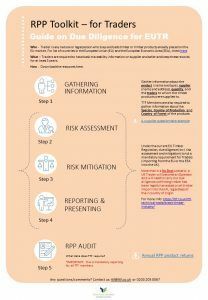 Note that in a No Deal scenario, a UK Trader will become an Operator and will need to carry out due diligence confirming timber has been legally harvested on all timber import into the UK, regardless of their country of origin. Find out more about how a No-Deal Brexit will affect you. What does RPP reporting require?